Ever since the iPhone launched here in Sweden we have been in love with it. Considering that we here at Pingdom deal with servers, networks and the Internet on a daily basis, we have evaluated a lot of iPhone apps aimed specifically at sysadmins and webmasters. In our opinion, the iPhone can be extremely useful to administrators responsible for keeping servers, networks and websites up and running. Loaded with the right applications, it becomes an on-the-move toolbox for when work needs to be done but there’s no computer nearby. This article lists 12 applications that will turn an iPhone into a veritable Swiss Army knife for any sysadmin, webmaster or network technician. Perform connectivity tests like ping, traceroute, port scanning and check website availability. Get information about domain names and DNS servers, perform WHOIS queries, find the location of servers, etc. Access servers and routers remotely with SSH and Telnet. Control your computer remotely with VNC. Test the speed and quality of your iPhone’s Internet connection. So, lets’ get started. 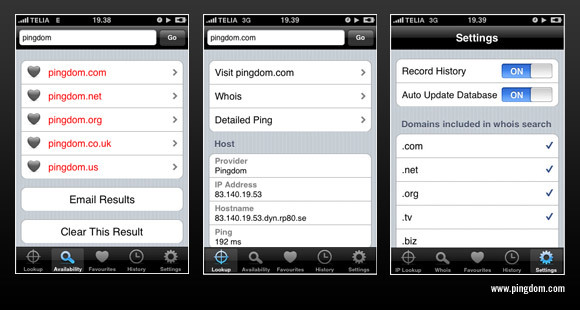 Here are the iPhone applications that any sysadmin or webmaster will be happy to have on his/her iPhone. As simple as they come, this application does exactly what its name implies. It shows you the WHOIS information for a domain name. It can be useful for finding out who owns a domain name and what DNS servers it’s using. If you want an app that does nothing but WHOIS queries, this is a good choice. If you’re dealing a lot with domain names, this is a great tool for you. You can instantly check if a domain name is available, you can perform WHOIS queries to get information about existing domain names, and there’s even a nice little function that will let you email the results. This is a similar tool to Domain Scout, but it has some additional functionality such as viewing information about servers (hostname, location, etc) and you can also ping servers with it. 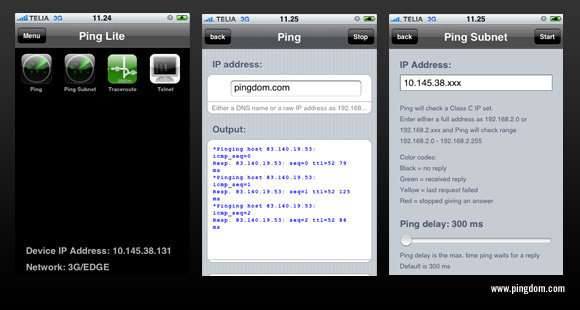 This is a network test tool that will let you ping and do traceroutes to IP addresses. It can even ping entire subnets and also includes a Telnet console for simple remote access to servers and routers. This is another network test tool. It will let you ping servers and also lets you do TCP port scans, get WHOIS and IP address information and see where a server is geographically located. Sometimes you may want to test the performance and quality of your iPhone’s connection to the Internet, including your download and upload speed. This application will let you do just that. It will also keep track of your test history. This is another application that will let you test the quality and performance of your iPhone’s Internet connection, just like Speedtest above. An interesting feature of this test is that the results can be voluntarily uploaded to a special website that collects results from its different users, and you can also view graphs of your own results over time. Previously called Teleport, this is a VNC client that will let you control your computer remotely from your iPhone no matter where you are. It supports high-resolution displays and will let you zoom in on the relevant area of the screen workspace. 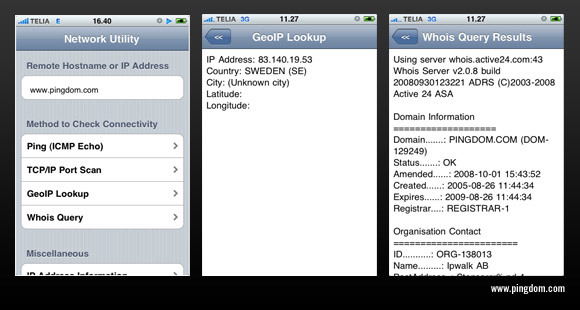 This is another VNC client, useful for when you want to access your computer remotely from your iPhone. There is a free, slightly limited version available (Mocha VNC Lite). As probably anyone can guess based on the name, this is an SSH client for the iPhone. 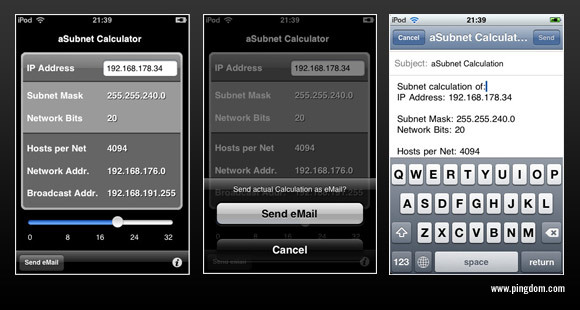 It will let you connect remotely to for example routers and servers, your iPhone acting as a Telnet terminal. 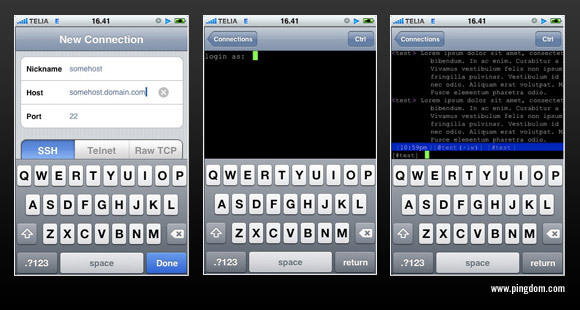 Another terminal application, this one provides your iPhone with an SSH, Telnet and raw TCP client. It is based on the famous desktop client PuTTY. This is definitely a niche application, but it can prove highly useful to network technicians. It will let you calculate IPv4 subnets extremely easily, instantly giving you information such as how many hosts you’d get per net, how many network bits you are left with, what the broadcast address is, etc. We hope you found this list both interesting and useful. It might be worth pointing out that we have only included applications that are available on the iPhone App Store. No need for any jailbreaking. Most of these applications are also supposed to work on iPod Touch. There is a certain amount of overlap between the features of some of the applications we have included, which isn’t a bad thing. We allowed it since it gives you some extra options. What fits one person may not fit another, and sometimes it simply comes down to taste. Now every sysadmin out there WITHOUT an iPhone has an excellent excuse to ask their boss to get them a company-sponsored one. 😉 You can thank us later. If you feel we overlooked any good applications, let us know in the comments. Great post, but oh man… Now I REALLY, REALLY want an iphone! Thats are great application for my iphone. The iSSH app is excellent, great when I need to restart a service or some small thing when I’m on the road. I use TouchTerm for ssh, its free, can use/generate keys for key based auth. Very handy. iNag is a great app If you use Nagios to monitor your networks. Please add it to your list. I love Gage for iPhone. Other speed test utilities allow me to test the overall speed of my internet connection. But as a Software Developer Gage lets me test a specific file on a specific server and display realtime results. I use it alongside Speedtest and find it indispensable! A very cool applications indeed. This just shows how people in different walks of life can depend on new technologies and certain programs. Things and tasks are getting better, lighter and more excited due to this new web and mobile applications. A very cool and exciting applications indeed. This just shows how people in different walks of life can depend on new technologies and certain programs especially of the iPhone apps . Things and tasks are getting better and lighter due to this new web and mobile applications.